I’m in some kind of an industrial facility and the machines are coming. I reach over my shoulder and pull out my katana. When I press the side of the handle an energy beam slides outward. Nice. Feels just like a lightsaber. A minute ago I was leisurely standing among hundreds of people at the VRLA Winter Expo at the Los Angeles Convention Center. Now, transported to this environment by the HTC Vive Pre and armed with this weapon in Raw Data from Survios, my body automatically braces itself differently. Back straight, arms rigid — I’m prepped for battle. Raw Data is only a couple months old as a project from Survios, an L.A.-based startup of more than 30 people. However, it builds on years of effort from the co-founders dating back to before the birth of Oculus. That feeling I described of subconsciously locking myself into a defense mode is precisely the kind of automatic behavior the co-founders are hoping to tap into with their technology. It’s very instinctual. Everyone as human beings, we’ve been hardwired to hunt, and to gather, and to protect and to kill and do all these crazy things. That’s why entertainment exists and that’s why art exists. A lot of human emotion and instinct drives that. This is almost like a final fulfillment of that kind of thing, where you can actually get in there and do whatever it is you want to do and have a release for that kind of fundamental human urge and have a blast while doing it. So now you can experience the rush of battle and you can experience the awe of exploration and discovery and all these things that don’t really exist very much anymore in the 21st century. Iliff worked at USC’s Mixed Reality Lab at the same time as Oculus co-founder Palmer Luckey. That’s where Survios was born, creating Project Holodeck at USC as a study in fully immersive VR. Around the time Oculus was getting acquired by Facebook, Survios locked down a $4 million investment. It’s been a long stretch of time (in startup years) so the company is ripe to receive, or to have already received, more money. Iliff wouldn’t discuss current fundraising efforts though. Instead, they are showing Raw Data as the first public reveal from the company in a long time. Being surrounded by images, sound and other stimuli that create a believable environment. Feeling or sense of actually existing within an environment. Having a virtual body or avatar that interacts naturally with the environment. Playing and interacting with others in shared digital space. 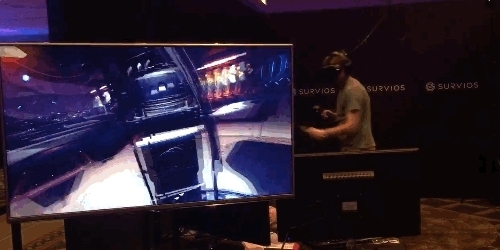 Being able to view and interact with people playing in VR from the outside world. Being completely unbound from physical restrictions in the outside world. I saw most of these things inside Raw Data. There is something deeply satisfying about dual wielding a pistol and a lightsaber-like katana. To close one eye and stare down the barrel of my gun and empty my clip into an oncoming android. To drop the gun and then deflect incoming energy beams with my blade like a virtual Jedi. To have the back of a fellow human being and to defend a position together. I was also timid inside the Vive Pre, unsure of how far I could walk. When the avatars of myself and the person in a bay next to mine got too close, my virtual arms broke. I was unable to pass through the avatar, causing an uncomfortable mismatch between what I felt in the real world with what I saw in VR. Precisely when I should be protecting my buddy against the machines I felt useless until I stepped away from him. The system Survios is building seems almost like a universal language for basic human interactions in VR. It could one day be applicable to a wide range of games and experiences — rather than a pistol, you grab a map or a flashlight from your side — and when I finished my time inside Raw Data, all I wanted to do was go back and get more acclimated to both the weapons and my walk-around freedom. My 10 minutes didn’t feel like enough time. Alas, the booth was packed at VRLA with people waiting more than an hour to get in after the event’s booking app failed to properly schedule demos. So I can report that Raw Data is a title I’m excited to watch evolve and Survios is a company I will follow with great interest as its interaction systems are applied to more experiences. It’s all about the kind of user that you’re going for and the kind of experience you want to show and the stories you want to tell. So there’s certainly a place for sit down VR with gamepad, even sit down with motion controls. Cockpit simulators and racing games are great for that. But there’s really something insanely exciting and visceral about being able to stand or sit, be able to get up and move around, interact with your environment in a living way, it’s almost a living breathing environment. And you can be there with your friends or multiple friends in VR at the same time accomplishing a mission together or playing a game together or socializing and hanging out.